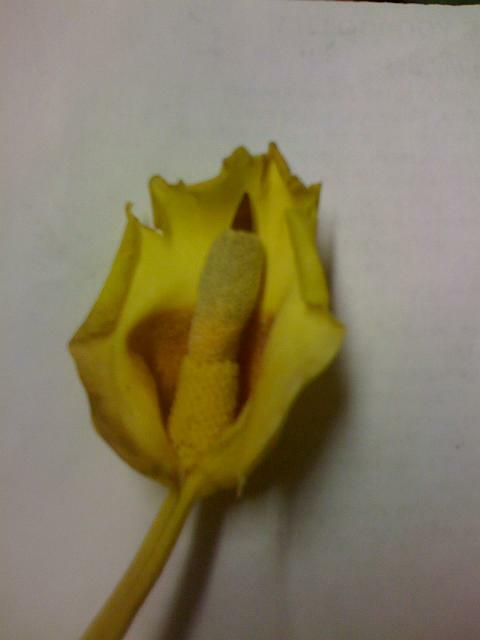 ebay vendor..... the corm is about 4" wide and the flower is about 5"
bottom of the flower where it would start opening. Probably koratensis based on the short spathe limb but it's really hard to tell if it doesn't open up well.? This group doesn't flower very well left out of the ground as the bud develops.? Some of the species like konjac, longituberosus and a bunch of other things will flower just as well sitting in a box as being planted but it's been my experience that koratensis and paeoniifollis will brown out.? There don't appear to be any offsets on this corm and that's also consistent with koratensis.? It does offset but produces fewer than the clones of paeoniifolius I have and not often on a small corm. who is this? 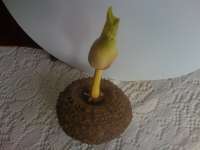 It was sold to me as a A. paeoniifolius from a Thailand ebay vendor..... the corm is about 4" wide and the flower is about 5" high..... I am thinking it might be A. koratensis, but my amorpho knowledge is limited. It is also starting to brown a little at the bottom of the flower where it would start opening. > am thinking it might be A. koratensis, but my amorpho knowledge is limited. > than the clones of paeoniifolius I have and not often on a small corm. > little at the bottom of the flower where it would start opening.